TCI has announced new models in the Mini-Jolly range – the Mini-Jolly 1-10V and Push and the Mini-Jolly MD IGBT / TRIAC and Push. 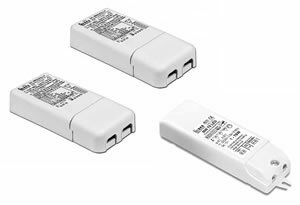 Mini-Jolly 1-10V – offering multipower outputs with DIP switch selection for output current between 350mA / 15W – 900mA / 15W. Other features include active power factor correction, 0 – 100% light regulation by means of push function, class 2 protection against electric shock, current regulation of +/-5%, protection against overheating and short circuit, mains spikes, overloads. Suitable for the supply of power LEDs and LED modules. Mini-Jolly MD – Offers all the same features as above and additionally phase dimming by means of IGBT or TRIAC. Both drivers designed to be used with between 6 and 12 LED. TCI has also introduced the Mini-Wolf 70 LED Dimmable LED Driver. The Mini-Wolf 70 is an independent transformer for 12VAC Halogen Lamps and LED bulbs (1 – 70W). The unit is small enough to fit through the standard 50mm ceiling aperture for MR16 / GU10 down lights and benefits from class 2 electric shock protection, terminal cover and cable retainer, other protection features include overheating and short circuit, mains voltage spikes and overloads. Click on the links below to download datasheets. TCI has been in the lighting market developing and manufacturing drivers for over 25 years. Certified and recognised to ISO 9001, VDE, ENEC, IMQ, KEMA, SEV standards, TCI have a global presence and are represented by Anglia Lighting in the UK and Ireland.